Surely I’m not the only one for whom that line of the song starts running through their head when they start to think about ice. What, I am? Um. Okay. Forget it even came up, then. 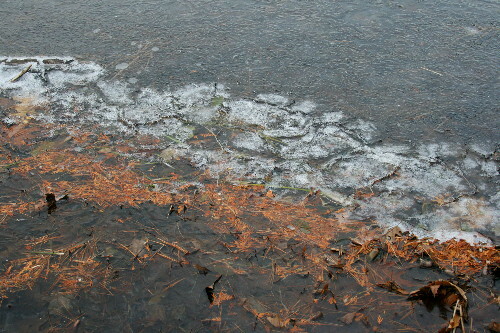 Today when we got up there was ice covering most of our sheltered little bay. 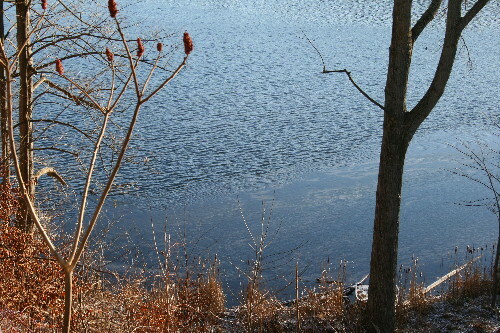 Just a thin sheet, and as the water lapped at the edges and moved underneath it tinkled quietly like a flock of little finches in the trees along the shore. It took me a while to figure out where the noise was coming from, it sounded so unlike what one would expect from ice. This is the first we’ve seen our bay (or really any larger water body) freeze up here, and suggests that winter isn’t too far away. The last few days have been cold, usually below freezing, and colder overnight. When we’ve gotten up in the morning, perhaps 6 or 7 hours after the fire has gone out, it’s been chilly in the house, 15 or 16 oC (around 60 oF). It’s tough to convince oneself to crawl out from under the covers, although upon coming back inside after taking the dog out to pee, it doesn’t feel quite so bad. We haven’t been able to find the shutoff valve for the outdoor faucet, despite repeated searching and conversation with the landlord, so we have it on a low drip to prevent it from bursting until we get that sorted out – I find it hard to believe that there wouldn’t be a shutoff. I ran off a few photos of the ice this morning, with the intention of posting them to the blog for today’s Today at Kingsford, and apparently Dan independently had the same idea – his photo is up here. His blog is still experiencing some growing pains as he figures out what works for him, what he’d like to share, what he’ll be able to maintain over the long-term, and also just simply what there is to post about. He’s decided to try doing a photo-a-day from around our home here to fill in the gaps between artwork and research. Certainly there’s no shortage of photo opportunities! I’m so pleased that winter has arrived… at least for the moment. I don’t like the long gap between the fall of the leaves and the first snow. When I look at your ice pictures, I can almost hear them, that tiny tinkling as the ice sheets crackle against each other. It’s a much more pleasant sound than the startling boom ice makes when it cracks in mid-winter. I really like your description of the ice as a flock of little finches. It is a beautiful sound.